In today’s challenging economic times, Ram-Lin’s experienced staff will be your strongest business partner. Our drug-free, hard-working team will assist with all steel and aluminum fabrication challenges and meet your delivery schedule with the excellence you demand. Our fully-equipped shop is a modern facility under roof located in Central Florida and serviced by three overhead cranes. Ram-Lin’s AWS D1.1 Certified Welders use 12 MIG/TIG welding stations and provide custom welding services for your fabrication project. The company has access to over 30 MIG/TIG welding stations with automated robotic welding cells also certified to AWS D1.1. We have FCAW, GTAW and GMAW capabilities. 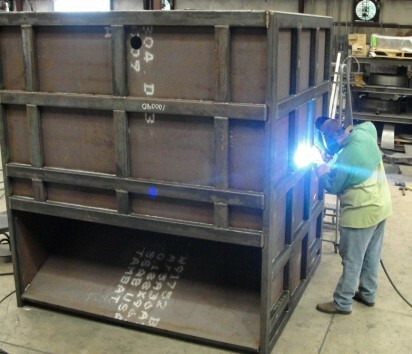 Our experienced craftsmen at Ram-Lin are the single biggest asset we have. Their commitment, attitude, and extraordinary work skills and ethics have made our exceptional growth possible since 1978. Support for a wide range of MIG/TIG welding certifications including: ASME, AWS, API and Military Combat Vehicle Code (Carbon Steel and Aluminum Armor Plate) Approved Standards.